Here at Learning To Learn we have a wonderful and exciting program designed to meet the needs of your 2-year-old child. The Yellow Duck group consists of up to 15 children and 2 teachers with an aide assisting at busy times such as lunch, potty training and nap. Your child does not need to be potty trained to join our group; this is something we will work on together when your child is ready. At this age we realize, for many children this is their first time away from mom and dad. We take great care in building relationships with our families and providing an environment your child can feel safe, secure and loved. Our Yellow Duck classroom is designed to be developmentally appropriate to meet their needs. At two years old we provide a younger academic curriculum exposing the children to basic shape, color, number and letter concepts. This provides a foundation to continue on to our program for 3-year-old children. We place a great emphasis on building verbal skills, self-help skills and social skills including sharing and taking turns. Our day always includes opportunities for sensory play, dramatic play, art, music, small muscle skills and a circle/story time. The Yellow Duck playground offers a variety of large muscle activities but flexibility in bringing our indoor projects outside. When the weather is nice they can even enjoy lunch and snack outside. Children Arrive Good Morning! All groups are together in the Art Room. Table activities, coloring and books. Please bring your child to the Art Room. You may bring in a breakfast for your child to eat before 7:30. 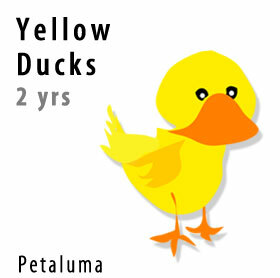 Yellow Ducks go to the Yellow Duck Room for self-selected activities. At this time the playground is set up, sandbox is opened and the room is set up for the morning. 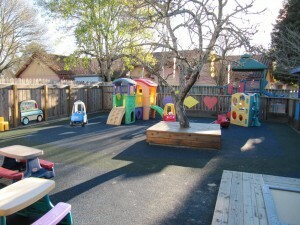 Indoor/Outdoor Option (Weather Permitting) The children may choose to go in and out for various activities. One teacher is always inside and one is always outside. The Readiness activity for the day is set up according to the curriculum list. Many activities are available. Potty Time Children are taken in small groups to the bathroom where diapers are checked and children are encouraged to use the toilet. After potty the children wash their hands and are ready for snack. Other potty times are done on an individual basis when needed. Snack Time. Children are encouraged to sit at the table during snack time. They are also taught how to feed themselves and clean up their place. Occasionally the children will make their own snack as a cooking experience. We encourage children to try new foods. Circle Time. All tables are cleaned up, and children are brought inside for circle time. Circle time includes short stories, songs, dramatic play, movement activities, finger plays and name games. Lunch The children all take turns washing hands and getting their own lunches. Children are encouraged to eat their “healthier” foods first. Please no candy or soda. Children are encouraged to sit at the table, feed themselves and clean up their eating area. Free Play. As the children finish eating, nap cots are put out & the children may go outside. As more children finish, two teachers will be outside with the children. One teacher will be inside finishing clean up, nap set up, and doing one more potty check. Nap Time. Each child has their own cot that is covered by a sheet and special blanket. Lullaby music is played and teachers rub children’s back. Potty Time & Wake Up Potty after nap, diapers changed, shoes on, and cots put away. Snack. A healthy school snack is served. The snack menu if posted on the Parent Bulletin board. Outdoor Play Outdoor play with many choices of activities. Depending on the weather an afternoon Art project will be done. Snack The children may eat anything remaining in their lunches. We will provide a small snack to those without anything left. Readiness Room.. Quiet activities in the Readiness Room, and getting ready to close the school.